Item one is the handle. I did not include it in the materials section since the actual material cannot affect the edge cutting quality and overall performance of a knife, but can affect the relationship of the cook and the knife. There are two major categories of knives’ handles; wood and plastic. Although wood is more traditional, plastic has emerged and it is pretty competitive since it is cheap, colorful and resists chemicals environments like the dishwasher. Regardless, however, the material the one thing that really matters is the feel. How does it feel in your hand. The fingers should wrap nicely around it, and be able to grasp it tightly. So a very good tip is to buy knives from a store where you can actually grab them and evaluate the feel in your hand. Regardless of the price, the material the design, if it does not feel nice in your hand, is probably worthless. Now what knives to you need? Huh… good question. 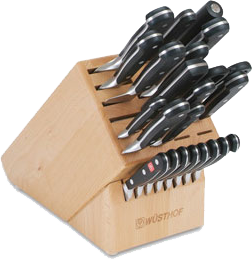 Nowadays, the most commonly found knives come in sets like the one shown here. They are pretty… Shiny.. with all the curves you would want. But do you need 10 knives? Well yes and now. There are knives for very particular purpose each one. Ig you are going to use them all, I would say go for it. The cold hard truth however is that most of them will never leave the block. Trust me I now… I owned 2 of them. I got in the loop and bought them for the same reasons that you are thinking or already bought yours. Because they are nice, pretty, complete and they make you feel like a real chef. The truth is that they end up to be more a decoration than actual cutting. The truth is that all I ever use is the Chef’s knife, and ironically the one that did not come in the set. Let’s see what is included in a typical chefs set and most of them are included also in the commercial block sets. Chef’s KnifeThe longest knife that is include on the set, at least in the more typical sets. It is between 7-14 in long and is has a straight spine and a curved blade, usually more curved towards the tip. It is quite heave and it is the knife for, cutting, chopping, mincing, julienning and dicing. The wide blade allows for better directionality when cutting vertically down since the knuckles can be used to guide it.Utility KnifeVery similarly shaped to the chef’s knife, but smaller. It comes through to the places that the chef’s knife due to the size cannot make it. Not quite as heavy and the length can vary from 3-7 in.Boning KnifeA knife that is distinct not due tot he sigmoidal curve shape only but also due to the material. It is a low carbon stainless steel and it can bend. This give it flexibility and can navigate around a bone removing the meat leaving no trace behind. To that great addition is the very thin blade that can allow for turns in narrow places, like in-between the bones of a rack.Paring KnifeThe sister/brother knife to the utility knife. It is very small 2-3 in and it comes through.. you guessed it, where the utility knife cannot go through. In addition the small size makes it ideal for jobs that need to be done of the cutting board like for example pealing and carving.CleaverNo introductions here. Well known from horror movies and of course from the butchers. It is also refereed to as butchers knife as well. It comes with a straght very wide blade. It is made for cutting bones and cartilage with ease. The size of the blade is there just to add a great amount of weight. With this lifting and lowering the knife gives it great momentum and therefore ability to break bones and cut joins in a snap.SlicerOne more specialty knife. This one is constructed by a straight edge with curved end. Its only purpose is to slice. To that, the narrow blade adds with small friction and sometimes the grooves on either side, allows for less drag. In some sets this comes just like a utility knife only longer.Serrated KnifeThe teeth are there to concentrate pressure. this is particular useful for cutting tomatoes and bread. Tomatoes have a thick skin over a soft tissue and therefore you need to be able to pierce through the skin to cut. Bread on the other side has a very tough crust that is hard to cut with a chef’s knife. There you need the strength of the serrated knife. 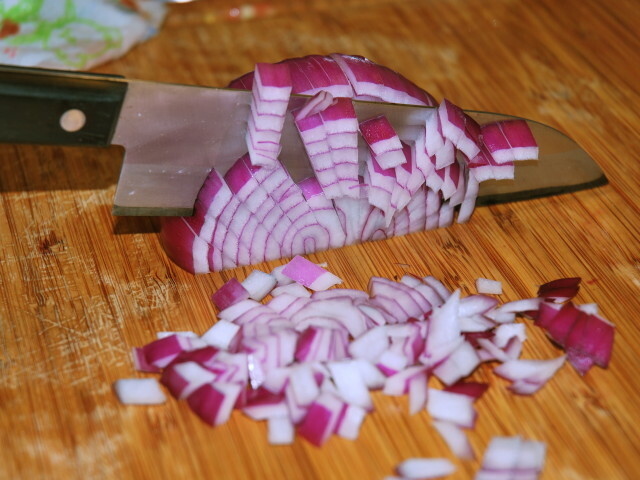 But, when it comes to vegetables for slicing and dicing, it is bad. Very poor control, and since the teeth touch the board only with the tips, you never have full contact with the surface.ScimitarHighly specialized knife. It is used by butchers for cutting meat. The long blade allows for cutting with a simple stroke while the curved upwards end increase the range of motion where the cutting is effective.Oyster KnifeJust there to open Oysters. Not sharp, just pointy and thick blade to be able to cut the join that hold the oyster shells together and pear it open.Clam KinfeSimilar for the oyster knifes but this one only for clams. A little thinner and more pointy suitable for the clams’ shells. Chef’s Knife The longest knife that is include on the set, at least in the more typical sets. It is between 7-14 in long and is has a straight spine and a curved blade, usually more curved towards the tip. It is quite heave and it is the knife for, cutting, chopping, mincing, julienning and dicing. The wide blade allows for better directionality when cutting vertically down since the knuckles can be used to guide it. Utility Knife Very similarly shaped to the chef’s knife, but smaller. It comes through to the places that the chef’s knife due to the size cannot make it. Not quite as heavy and the length can vary from 3-7 in. Boning Knife A knife that is distinct not due tot he sigmoidal curve shape only but also due to the material. It is a low carbon stainless steel and it can bend. This give it flexibility and can navigate around a bone removing the meat leaving no trace behind. To that great addition is the very thin blade that can allow for turns in narrow places, like in-between the bones of a rack. Paring Knife The sister/brother knife to the utility knife. It is very small 2-3 in and it comes through.. you guessed it, where the utility knife cannot go through. 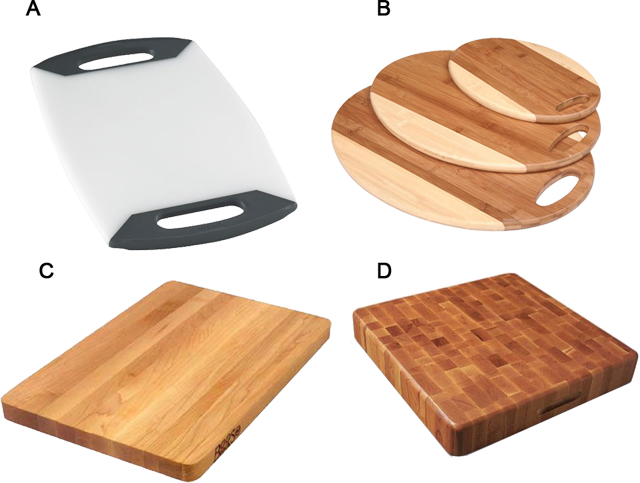 In addition the small size makes it ideal for jobs that need to be done of the cutting board like for example pealing and carving. Cleaver No introductions here. Well known from horror movies and of course from the butchers. It is also refereed to as butchers knife as well. It comes with a straght very wide blade. It is made for cutting bones and cartilage with ease. The size of the blade is there just to add a great amount of weight. With this lifting and lowering the knife gives it great momentum and therefore ability to break bones and cut joins in a snap. Slicer One more specialty knife. This one is constructed by a straight edge with curved end. Its only purpose is to slice. To that, the narrow blade adds with small friction and sometimes the grooves on either side, allows for less drag. In some sets this comes just like a utility knife only longer. Serrated Knife The teeth are there to concentrate pressure. this is particular useful for cutting tomatoes and bread. Tomatoes have a thick skin over a soft tissue and therefore you need to be able to pierce through the skin to cut. Bread on the other side has a very tough crust that is hard to cut with a chef’s knife. There you need the strength of the serrated knife. But, when it comes to vegetables for slicing and dicing, it is bad. Very poor control, and since the teeth touch the board only with the tips, you never have full contact with the surface. Scimitar Highly specialized knife. It is used by butchers for cutting meat. The long blade allows for cutting with a simple stroke while the curved upwards end increase the range of motion where the cutting is effective. Oyster Knife Just there to open Oysters. Not sharp, just pointy and thick blade to be able to cut the join that hold the oyster shells together and pear it open. Clam Knife Similar for the oyster knifes but this one only for clams. A little thinner and more pointy suitable for the clams’ shells. So among all these knives what do you need? 1) A chef’s knife is the obvious choice here. It is the one knife that you will be using 9 out of the 10 times. You will be performing more of the usual task with it. Cutting, dicing, julienning, batonneting, chopping, mincing etc. 2) A paring knife is the second most essential cutting device you can invest on. It is amazing. Not only for pealing and curving but for all the fine work. Removing the seeds of a pepper, pitting peaches and large fruits, hollowing veggies and many more. 3) A serrated knife. Although it is not used as often in the tasks that it performs it cannot be replaced or substituted. 4) A slicer. It can be used for slicing a roast, a delicate desert or even bacon and prosciutto. The low drag and friction cannot be found on any other cutting device, and although it can be kinda replaced by a chef’s knife it is not suitable for delicate things like a terrain. A utility knife might come in need once in a while but it is easily substituted by a paring knife. Cleaver and scimitar unless you are a butcher you will never use. And if you use, then most likely you will lose a finger or two. So all you need are 2 knives, a chef’s knife and a paring knife. Slowly and based on your skill and needs you can start building around your flagship knife and it’s assistant a fleet of knives. The question now is where to cut? The knives, need a surface that will yield on their blade, so the blade is not damaged. Under these considerations, the glass, granite, metal and marble are completely out of the question. Absolutely not. Besides the grinding of the blade against their surface is so annoying. The next choice is plastic and wood. And yet again there are choices there as well. Among the plastic the best material is polypropylene (A) that is soft and a bit not slipper so the knives can grab to it. But nothing compares to wood. There is traditional wood and recently there are options that include bamboo boards (B). The bamboo boards are an excellent choice, cheap, renewable, hard… but they are very fibrous, giving strong grain lines that when cutting parallel to the them the knife can chip them off, can stick and when cutting perpendicular to them the knife slows down. The last class is wood, usually hardwood like oak and maple. The hardwood not only allows for durability but more importantly has very small pores making it harder to harbor bacteria. And there we have to choices, grain (C) and end grain boards (D). The regular grain has some of the disadvantages of the bamboo but not anywhere near them. It is durable and can be treated to last for very long time. The end grain looks a lot like a chess board, it consists on small pieces of wood glued together. The end grain has no directional fibers making cutting much easier. Also since the knife does not align with any grain lines, it is hard to cut through or chip of the board. Regardless of the board you will get you should take very good care of it. Plastic boards need to by rinsed in warm soapy water and let dry thoroughly. Plastic can be even but in the dishwater or cleaned with a dilute bleach solution (10% bleach) to disinfect. This makes it ideal for cutting meat. Wooden boards should be rinsed in soapy water, and once in 6 months polished with some sand-paper and treated with a food grade mineral oil. This will seal all the open pores preventing bacteria. You should not use it for meat and if you do keep it on the side just for meat. Buy knifes as you need them and avoid sets. Invest the money you saved on a better knife. Choose the material based on your budget and needs. All blades are good, some are just a bit better. Make sure the knife feels nice in your arm. The most expensive knife will be worthless if it does not feel as the extension of your arm. Choose a nice cutting board. Wood or plastic, just not glass, granite metal and marble. With all these simple information, you can build your cooking skills upon a great start. Knife was the first cooking gadget and it is still the base of every kitchen. To polish your knife skills you can try the following recipes salsa, pineapple mango salsa and ceviche.